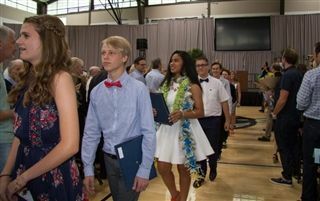 The last day of school, Tuesday, June 13th, was marked by an important rite of passage, as Pacific Ridge eighth graders were promoted to high school in a formal yet lighthearted ceremony in the Athletic Center. In addition to words of congratulations from Middle School Head Andy Wright and 8th-Grade Dean Kelly Clampett, a group of faculty members took turns addressing the rising 9th-grade students to offer bits of wisdom, humorous sentiments, and heartfelt wishes. Mission Awards were given to Middle School students who demonstrated a commitment to various aspects of the Pacific Ridge mission statement. Then, each student was individually recognized and crossed the stage to receive a diploma. Upper School, here they come!